• Proven and powerful 59 hp (44 kW) turbocharged Kubota® diesel delivers exceptional mowing power to effortlessly slice through the tallest, thickest grass. 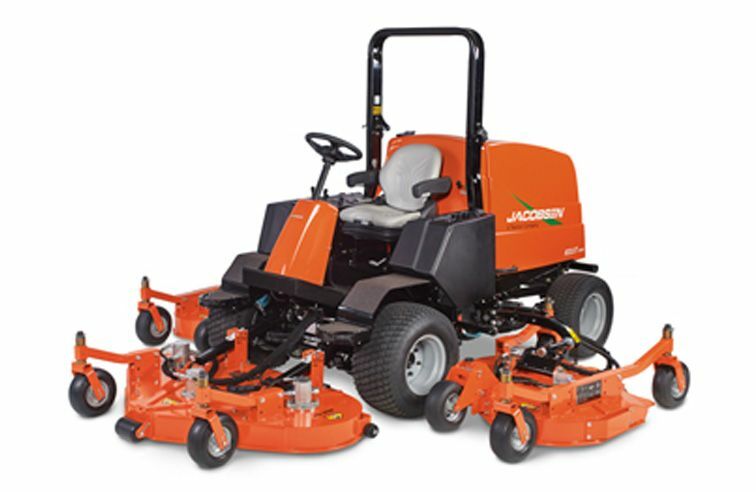 • Independent deck control allows mowing with 1, 2, or all 3 decks to trim around obstacles, varying terrain and wide spans of turf. • Individual hydraulic deck motors with self-lubricating integral bearings deliver reliable cutting power to each blade and require no tensioning or greasing maintenance of belts and pulleys. • Maintenance free, wet parking brakes deliver safe braking on even the steepest of slopes and reduce total cost of ownership with no linkages or pads to service or adjust. • Air-ride suspension seat, ergonomic cockpit cruise control and an optional climate controlled cab provide a comfortable, productive ride for long hours of operation. 12V battery with 750 cold cranking amps; 45-amp alternator. Overload protection with circuit breakers and fuses. Hydrostatic, closed loop parallel system; variable displacement piston pump; high-torque fixed displacement piston wheel motors; automatic flow divider for anti-stall and limited slip; motors on rear wheels electro-hydraulically engage/disengage for selectable 2WD or 4WD in transport; full-time 4WD in mow. 4080 lbs. ; Cab Installed: 4606 lbs.